Today Mr Ndetele asked if I could take a picture of him with his son, so I agreed to stay after school to do this. At 3:00 pm his son had still not arrived and he said he shouldn’t be long he was just walking home from school. I quickly ascertained that 'school' was Funguni Primary School in Pangani and as his son was walking the 5km home including THE HILL, and they didn’t finish until 2:30 the same as Boza, I couldn’t see him arriving in the near future. I decided to come home with the option for Mr Ndetele to turn up with his son for a photo session later in the day. 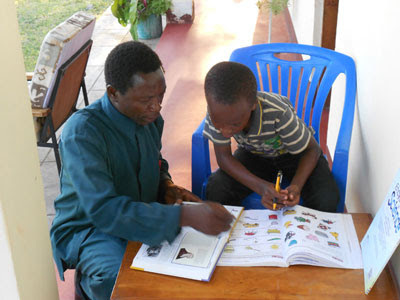 Basically it seems that the Lutheran church that Mr Ndetele and his wife are both heavily involved in, had a visitor from the states last year who took an interest in their son and has sent him some text books and an offer to keep in touch. Mr Ndetele wanted some photographs to send to the states to show his ‘sponsor’ the success he had produced so far and to ask for more help. 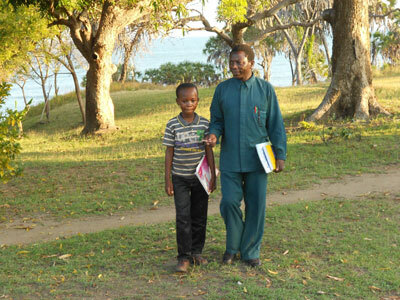 His son walks the 10k to and from school on Monday, Wednesday and Friday but has a treat on Tuesday and Thursday when his father spends Tsh 1500 a day to hire a bike for him and I think the hope is that the American gentlemen will ‘shell out’ for a bike. Good luck to them both, I hope it works. The only other thing of real note was the information that I could go on the Form III trip to the Abori Caves tomorrow. I was quite gratified when I went in and informed Form III in Swahili that they were going on a trip to the cave tomorrow and then added, also in the tongue, “with me”. There was a big cheer, which was quite encouraging until Sakina said, “You will take your camera?”, and I realised it wasn't me but a photo opportunity they wanted. I did have another interesting visitor when I got home when this millipede walked, or rather flowed, across the front of my door. 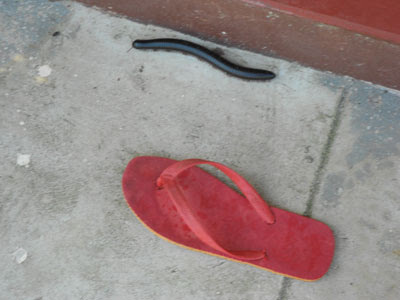 I felt I had to throw my Size 12 'flip flop' down to give you some idea of scale. It was certsilny a big b*******r.